The Kidde HD135F 120VAC wire in heat alarm gives you and your family an early warning to dangerous temperatures of 135˚F or more. This unit can be used as a single station unit or it can be interconnected to up to 24 Kidde devices in a multiple station arrangement. 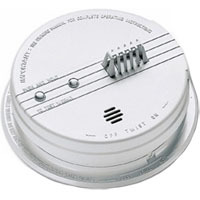 The interconnect system must not exceed the NFPA (National Fire Protection Association) limit of 18 initiating devices (Smoke, heat, CO, etc) interconnected, it is still possible to interconnect 6 strobe lights and or relay modules. The HD135F includes a tamper resist pin to help deter tampering or theft. Interconnectable - Interconnects with up to 24 Kidde devices of which 18 can be initiating. Test Button - Tests unit's electronic circuitry, horn and battery function. 9V Battery Back Up - Provides continuous protection even during power outages. Red LED - Flashes every 30-40 seconds to indicate proper operation. Low Battery Indicator - Alerts user in the event of a low or missing battery. Quick Connect Power Harness - Makes installation fast and easy.